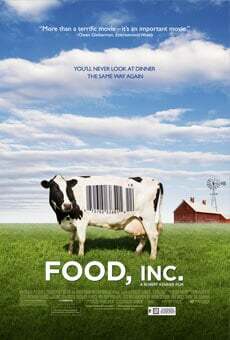 Before I dive into this post I want to ask you to please watch Food, Inc.. Even if you have watched it before…watch it again! This is a very easy way to learn a lot in a mere 91 minutes of your life. And hopefully you will join us with a completely renewed perspective when it comes to eating meat. After watching the movie I’ve heard some people say they would never eat meat again (which we of course do), and others say they went out and had a Big Mac the very next day. So don’t take anyone else’s word for it…watch the movie and form your own opinion. And if for some strange reason you don’t watch it, at the very least please read my summary of the film. Local Meat: Not only do we like to promote eating locally raised meat, but just about anything you can buy through your local farmers will be better for you and the environment. I wrote a post a while ago about how produce, on average, travels 1500 miles from the farm to your plate. Not only do those fruits and vegetables lose nutritional value during their trek, but the by-products from all of that travel also have a very negative impact on our environment. When it comes to industrialized meat, not only does the travel aspect take a toll on our environment, but the resources used to raise, feed, and slaughter the animals do as well. Secondly, the only way to truly know if the meat you are eating was humanely raised is to ask the farmer yourself. And even if the meat comes from an organic factory farm it doesn’t necessarily mean it was raised or fed properly. And the health of the animal directly affects the nutritional value that their products provide you. Secondly, consuming meat at the alarming rate that it is being produced is not good for our health. Bittman says that our current rate of meat consumption has “stimulated a fundamental change in our diets that has contributed to our being overweight, even obese, and more susceptible to diabetes, heart disease, stroke, and perhaps even cancer.” Michael Pollan sings a very similar tune in regards to the effects our over consumption of meat has on our health. Learn more about his viewpoint in my post about “Becoming a ‘flexitarian.’” The moral of the story is the less meat you eat the more of something else you will eat instead, and let’s hope that turns out to be vegetables and fruit. I will like to take the 100- day challenge. Just me and my husband. Please sign me on! I had no idea that I’m a flexitarian until I read this! I just thought I was someone who doesn’t eat meat every day, but isn’t willing to give up Thanksgiving turkey and Christmas prime rib, and the occasional other meat dish. So, I love the idea of cutting down meat and I was starting to do this until a couple of years ago when I discovered I have some food sensitivities (allergies) that needed attention (dairy, eggs and gluten). So, I went back to eating primarily meat and vegetables, which makes it hard to cut down on meat. I was under the impression that a lot of the diseases like cancer and heart diseases and other illnesses were contributed to by eating conventional meat (raised on antibiotics, etc). Are you saying that regardless of where your meat comes from (we strive for local, grass-fed, antibiotic free, etc), there is a greater risk of illness if you are eating meats, especially red? Hi Angie. While buying local, organic, grass-fed etc. makes your meat consumption smarter and better for you as well as more sustainable, it is still a very good idea to have meat be the smallest portion of your meal. The rule in our family, if serving meat, is that 3/4 of the plate be veggie/salad/fruit and a bit of whole grain (quinoa, brown rice, etc). This article might shed a bit of light: https://www.ncbi.nlm.nih.gov/pmc/articles/PMC4698595/. I lost 90 pounds over 18 months by cutting out the majority of processed foods and lowering my carb intake. I ate lots of veggies and fruit, and meat, to make me feel satisfied and full. We would like to cut our meat consumption, but can’t up grains much as it raises my blood sugar. How do you feel full and not feel like you’re starving 2 hours later with little or no meat? Hi Shannon. You can add things like nuts, seeds, and beans as well as healthy fats. Avocados are a good example of a healthy fat. We are lucky enough to eat wild game that we harvest ourselves. It is much leaner than store bought meat & I think a necessary component of our diet (esp iron). We eat it almost daily & have cut out processed foods & refined sugar & minimize grains with great results in improving how we feel & getting to healthy weight. I would not consider reducing our intake. Also watch forks over knives movie. I am following a plant based diet and have cured my allergy issues. I am losing weight and has helped my joint pain. Have you watched “The Magic Pill”? Hello. Yes, I have. Not sure about the rest of the team.